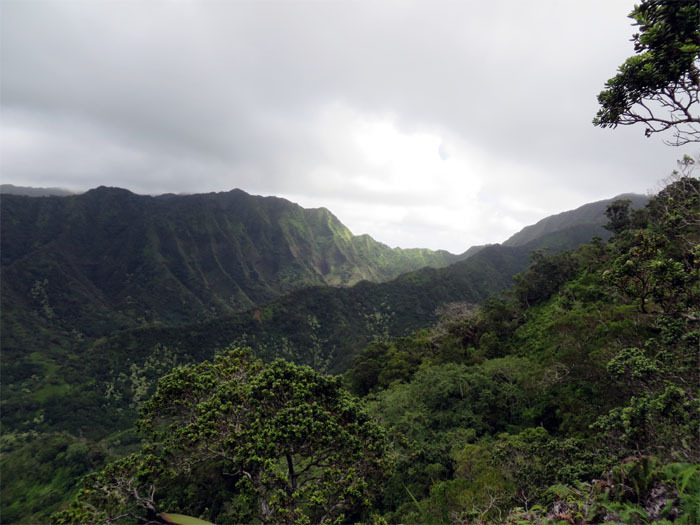 I had gotten invites to hike Bear Claw Right Fork and Lanihuli on this Labor Day. Hmmm. 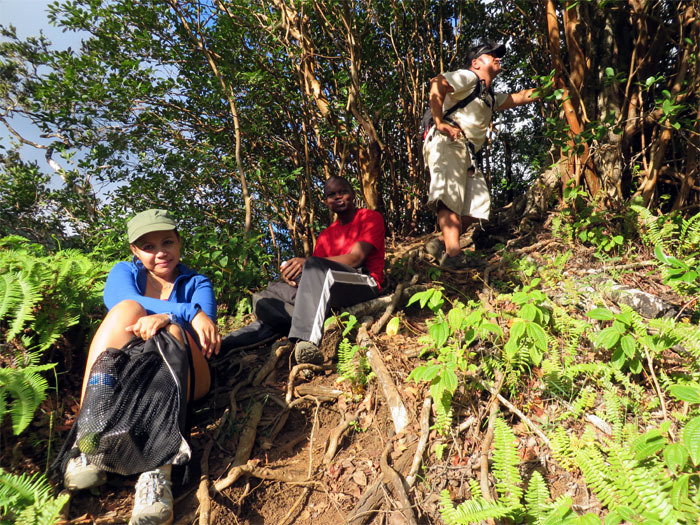 Feeling in the mood for something different, I was fortunate to hook up with Lita and her crew of Jasmin, Michael and Rey for the hike up to Pu’u Keahi a Kahoe. 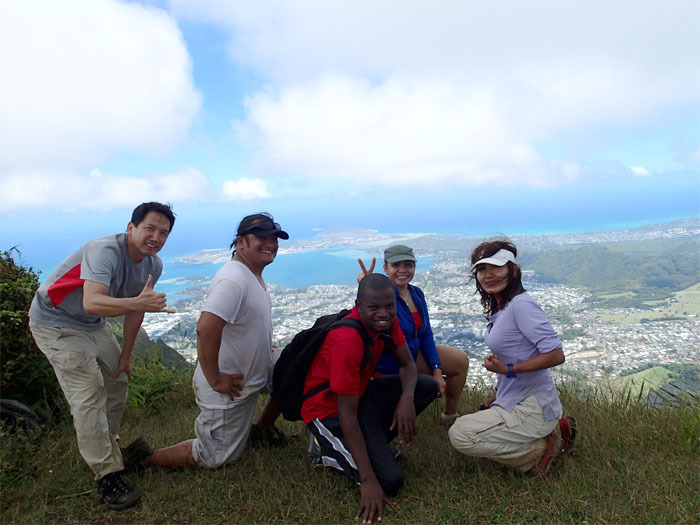 A Korean Hiking Club member was nice enough to take our group photo. 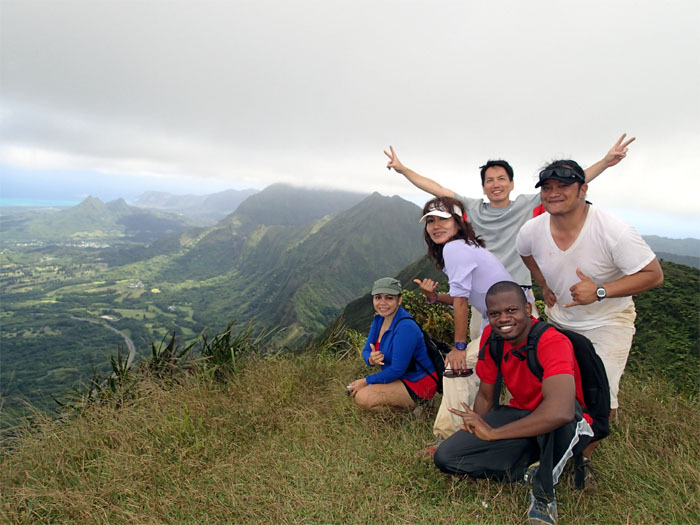 Left to right: Michael, myself, Reynante, Lita and Jasmin. 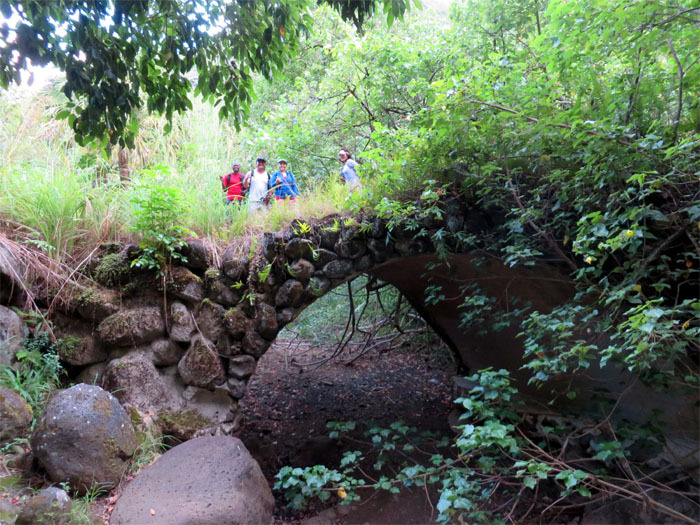 One of seven arched stone bridges that crosses Moanalua stream. 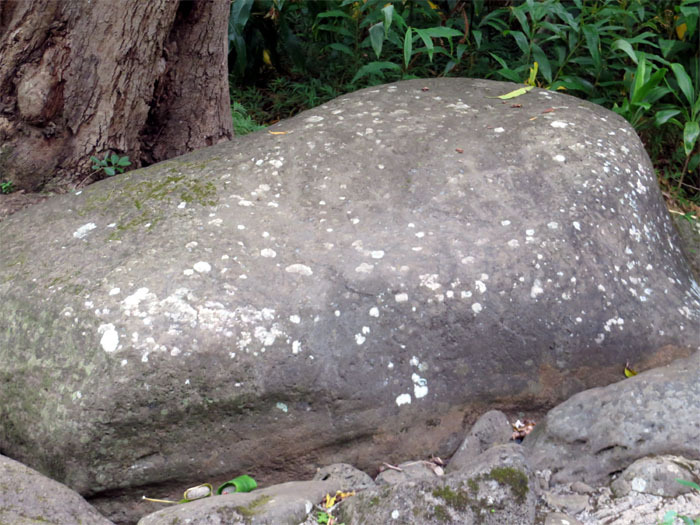 The petroglyph rock that stopped the H-3 from coming through this valley. 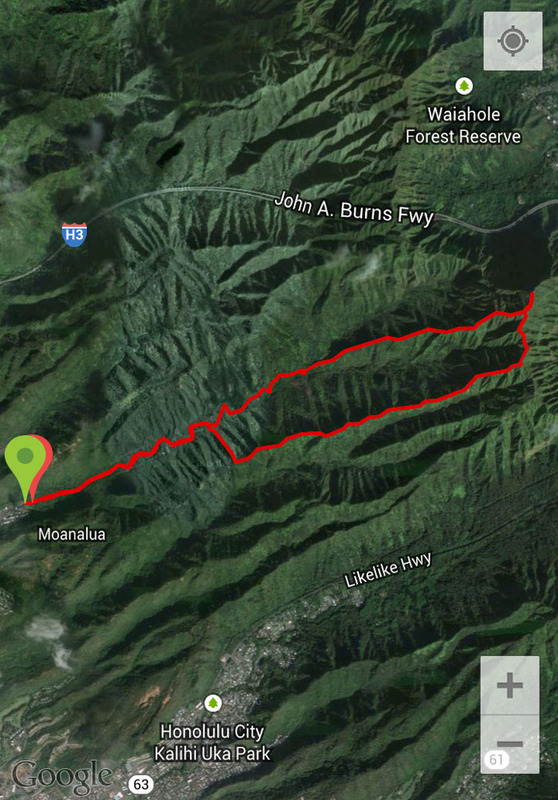 We left the old carriage road and turned right at Marker 12 to start our climb up towards Tripler Ridge. Photo by Lita McGovern. 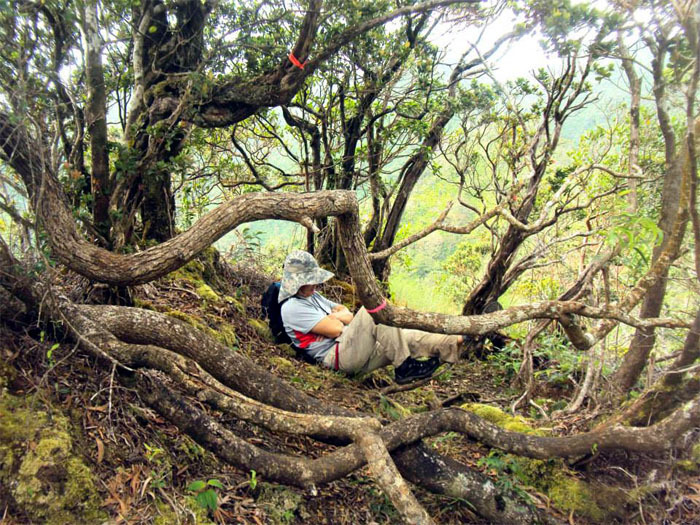 Taking a short break from the vegetation. Photo by Lita McGovern. Continuing the steep climb. Good cardio workout. 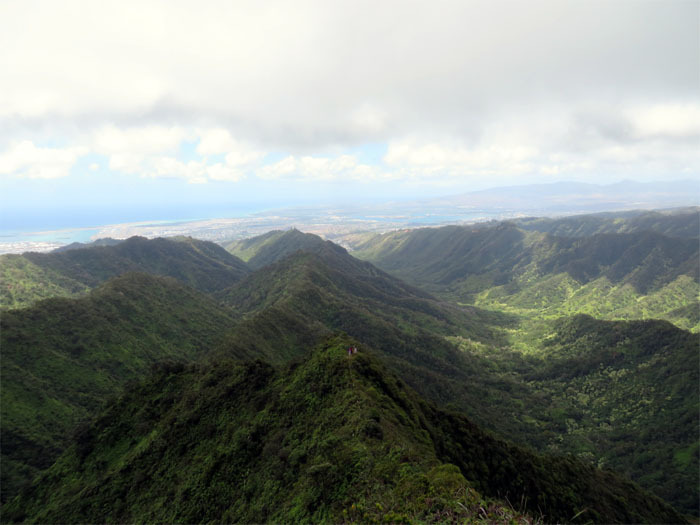 The low cloud deck and breezy trade winds helped to make the hike a little more comfortable. Looking at our way back down. 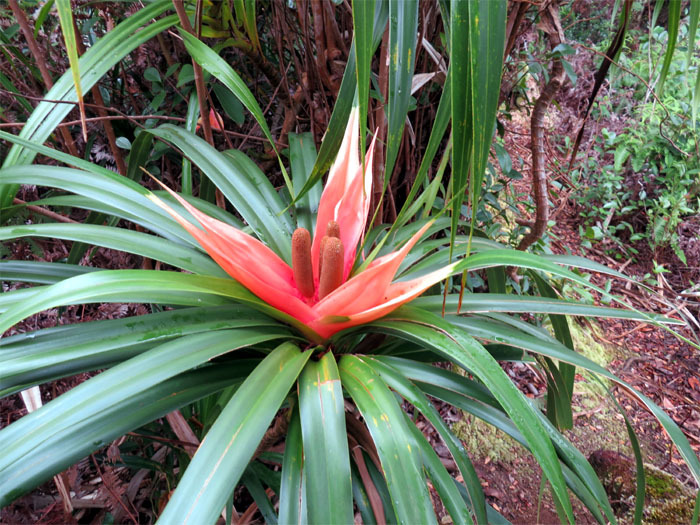 ‘Ie’ie in bloom, a endemic and woody climber of the screwpalm family. The H-3 would have definitely changed the character of this valley. 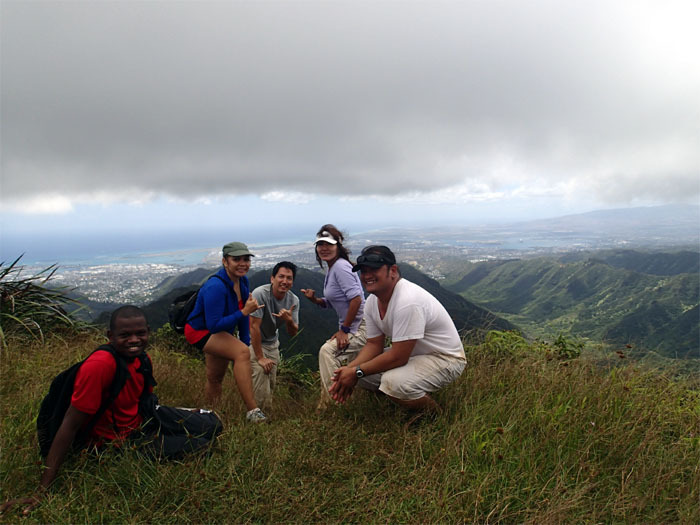 We still have the other side to hike on! 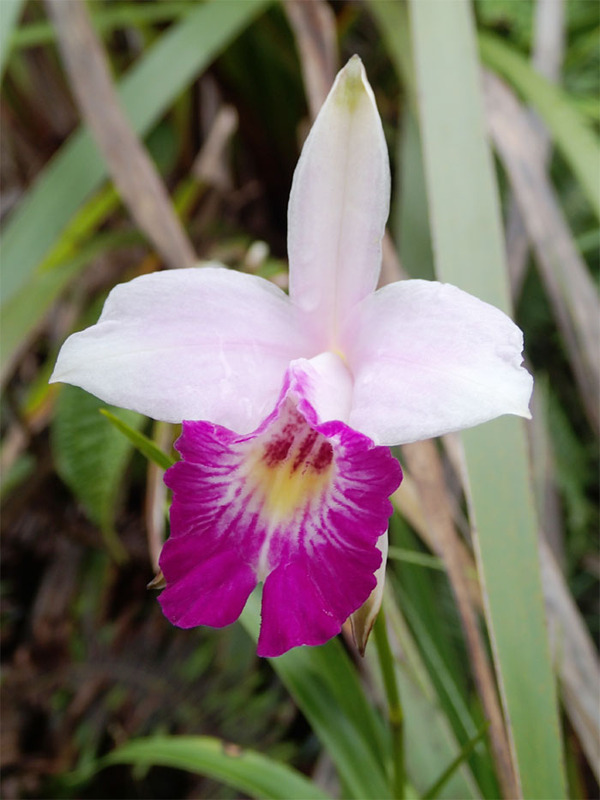 A beautiful but invasive orchid. The group was nice enough to let me catch a quick nap. Photo by Jasmin Nepomuceno. 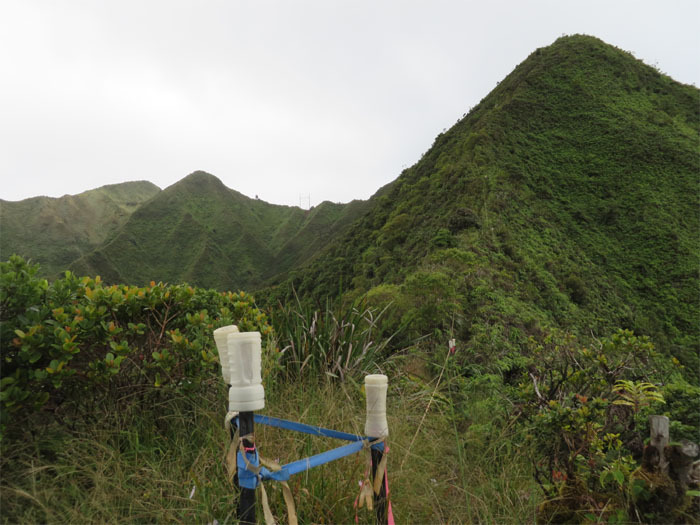 We followed the bottle capped stakes to the summit. Can you find the group? 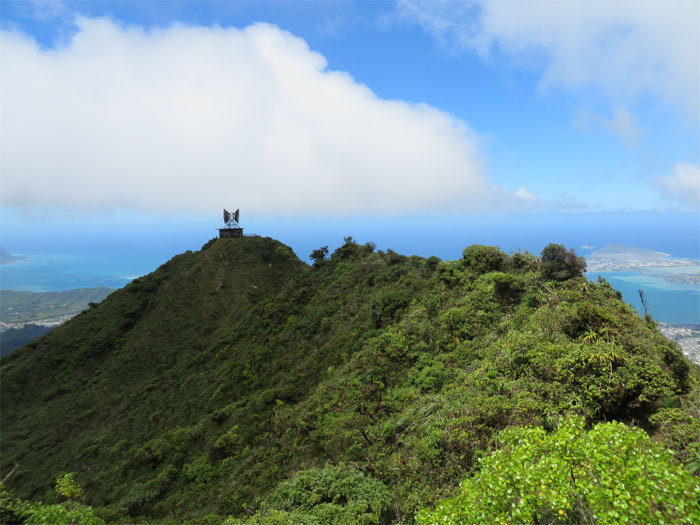 We arrived at the top to be greeted by 360 degrees of blissful views of the island. I never get tired of these unrestricted views. Mother Nature was very nice to us today. Just outstanding views all around. Making our way down the Bowman trail of the ridge. 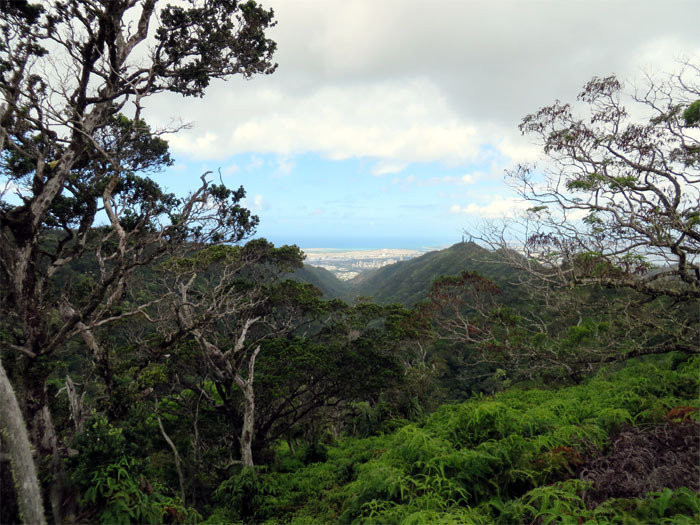 Lita looking out towards the Windward side of the island. Rey and myself couldn’t resist climbing on the WW2 relay station. Still solid after all these years. Photo by Lita McGovern. Pushing up the last big hill. We climbed up the ladder to the top of the CCL building. Yes, a ladder. Before there was a rope. Before that was nothing. Now it’s a lot easier to get on the top. Photo by Jasmin Nepomuceno. Not another soul in sight. We had the place all to ourselves. Photo by Lita McGovern. We followed the ridge back to the middle junction to head back into the valley. I have been up this ridge a couple times, my first time going down. The daylight was drawing shorter as we got closer to the valley floor. 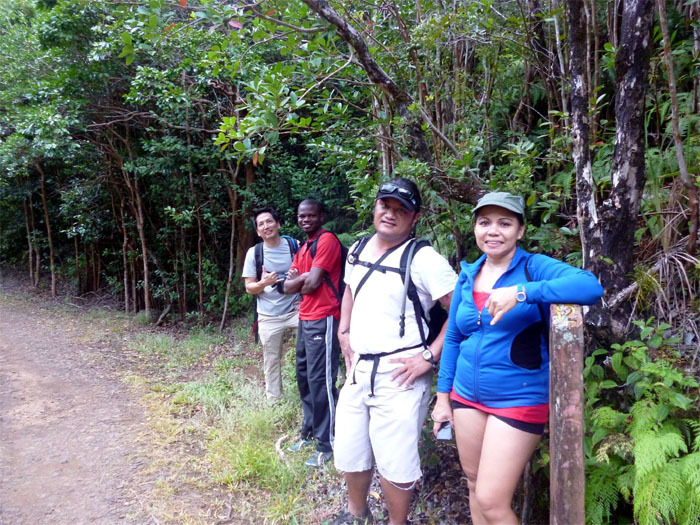 Rey had torn his shorts earlier on the hike, putting him and others in an awkward situation. Glad he wasn’t commando on that day. The rest of the group coming out of the middle ridge trailhead. They look happy. One more so than the others. The 10.14 mile hike lived up to it’s reputation as a long trail but the payoff was views that can’t be matched and making new hiking friends. Thank you for this post! 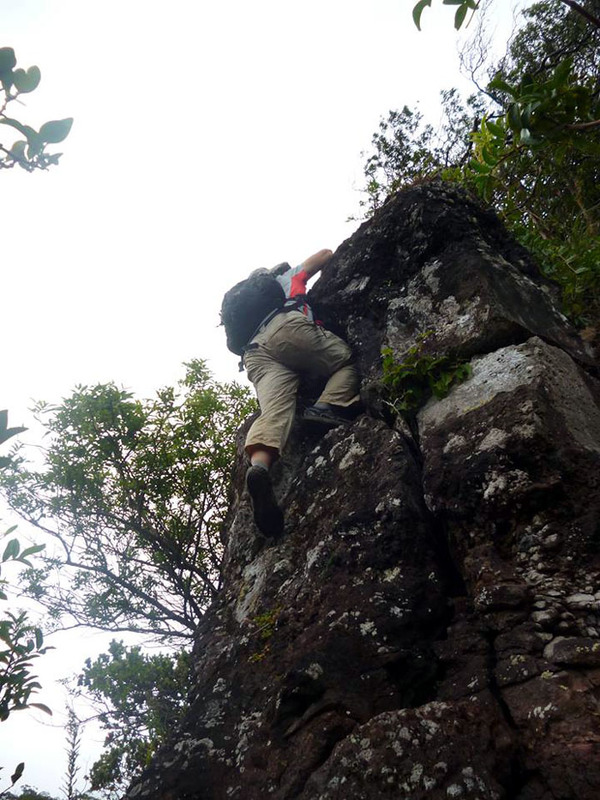 Was it extremely challenging to come back down? I’ve only read about people coming down the stairs, and I was trying to avoid it all together. Thanks for stopping by. 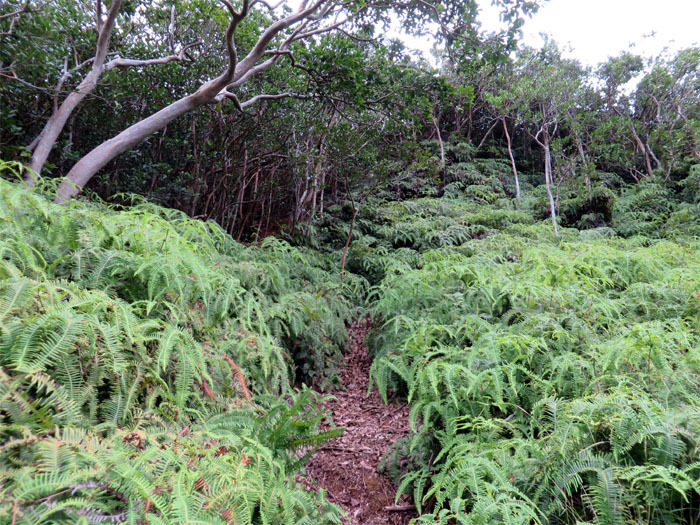 Coming down Moanalua Middle Ridge is not really challenging by any stretch, unless it’s raining heavily, then you will be slipping and sliding. Just take your time and be safe. Yeah, I would not recommend going down the stairs as it’s supposedly 24/7 security. 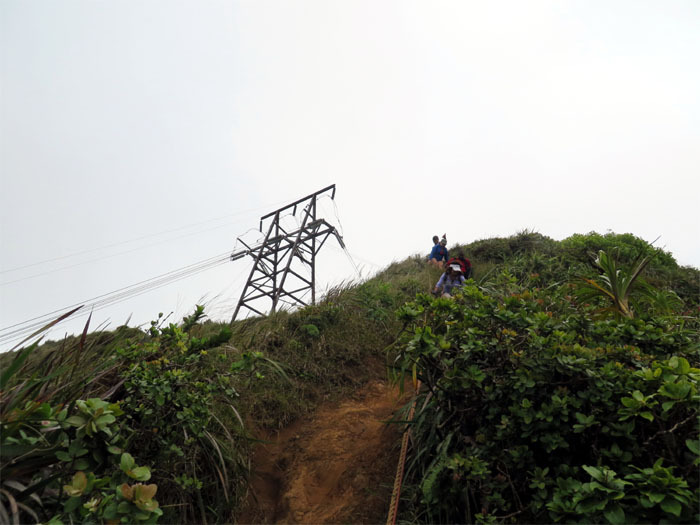 We went down it this past Saturday only because one of our crew had injured her thumb and it was raining. 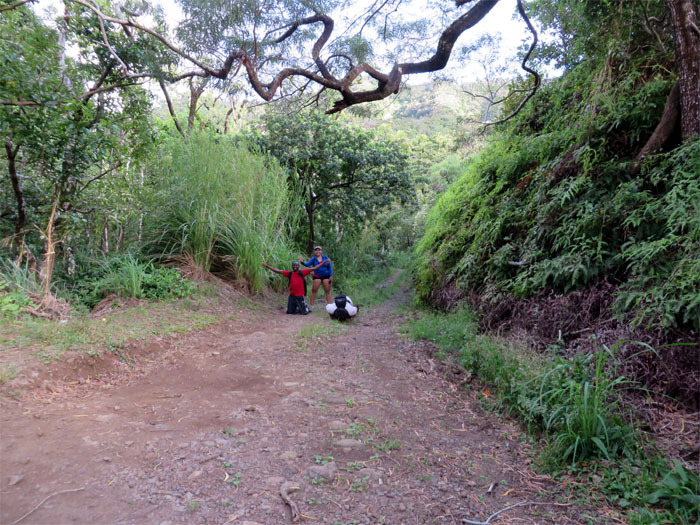 So we felt that was the shortest and fastest route down, but the guard yelled at us. So I would give the stairs a wide berth. Kenji, thanks again for letting us tag along with you down the stairs this past Saturday and the ride back to the other side. I would have joined you guys for lunch if I didn’t have kiddos at home waiting on Dad! Great site, looking forward to more pics! Nice meeting you and your friends at the top. Glad the only thing we got at the bottom was some yelling! Thanks again! Hi Thank you so much for sharing this lots of useful info. 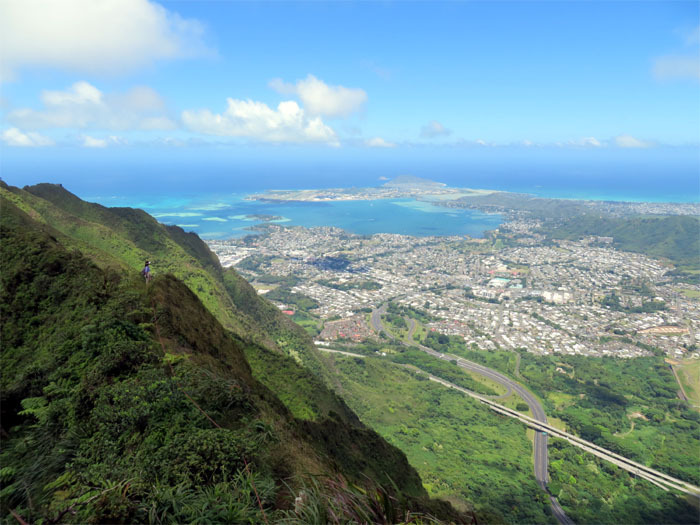 I have a group trying to do the same route (avoiding the illegal stairs) Jut trying to figure out how to spot 1. the breakoff point from moanalua valley to the tripler ridge and 2. the breakoff point from coming back down the radio station towards moanalua middle ridge. Thank you in advance if you can reply to this soon enough. 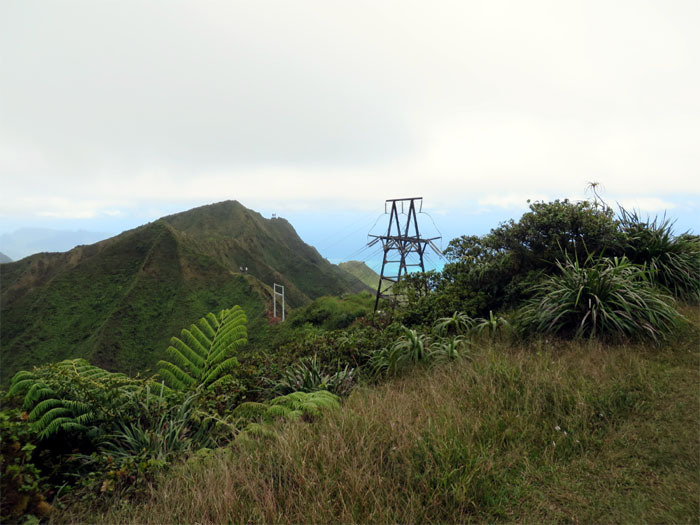 You will spot a wooden marker with the number 12, that is the route to go up Tripler Ridge. 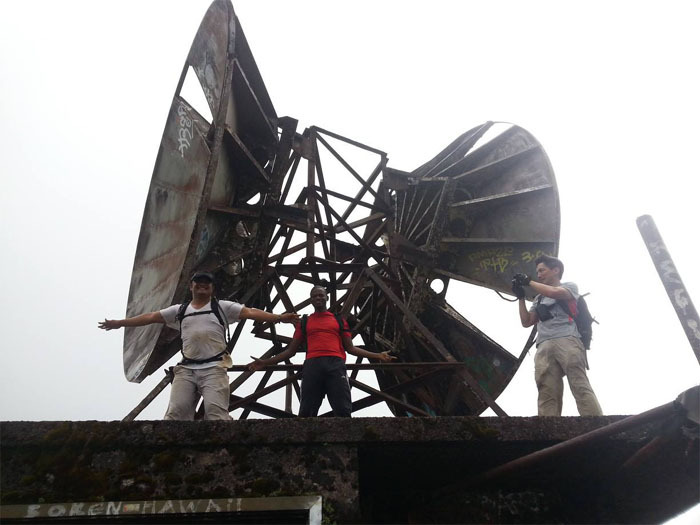 Then you will summit and make a left towards the radar station and climb the hill. 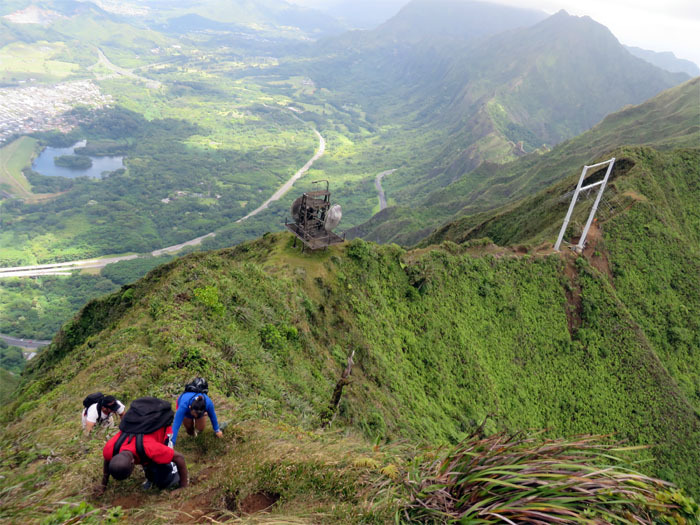 You will see a wooden sign that says Moanalua Middle Ridge that will take you back down into the valley. If you want to see the stairs, it’s to the right of the middle ridge junction. Have fun and be safe. Hope this helps. I see. 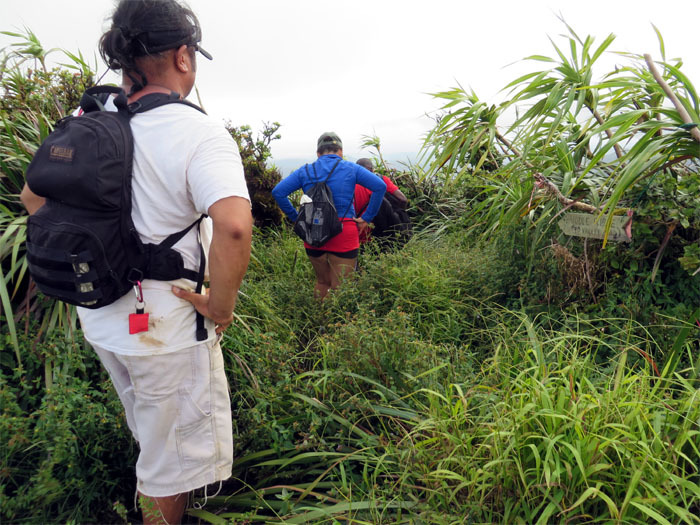 Sounds like marker 12 should be easily spotted on the moanalua valley trail. Thanks a lot brother. Big big help. Mahalo. You’re welcome. Stay safe and happy trails! 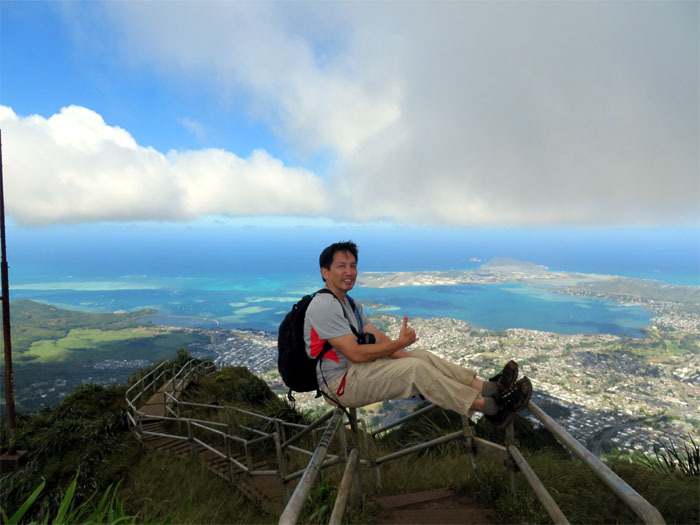 I am in good shape and an experienced hiker. What do you think round trip time would be and safety of going solo? Thanks. 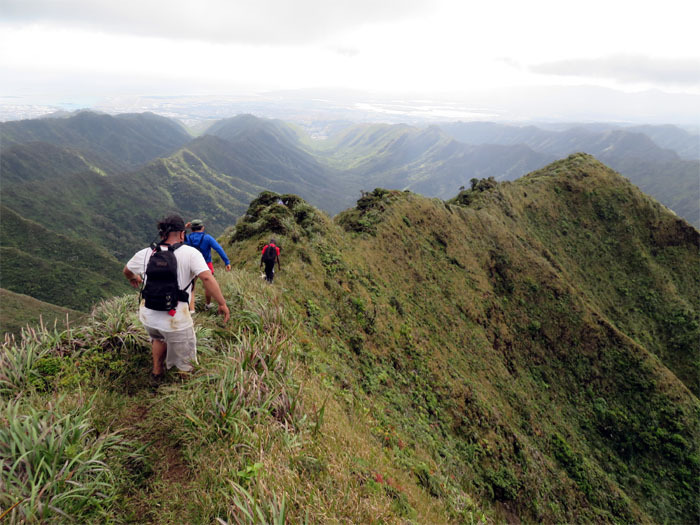 I’ll be in Oahu mid to early July from the big island and would love to do this hike. If you are hustling, you probably could do it in 6-8 hours. Cruising time would be 10 hours plus. I would recommend one never hike solo, as depending on your cell phone carrier, it will be slim to spotty back there in the valley. 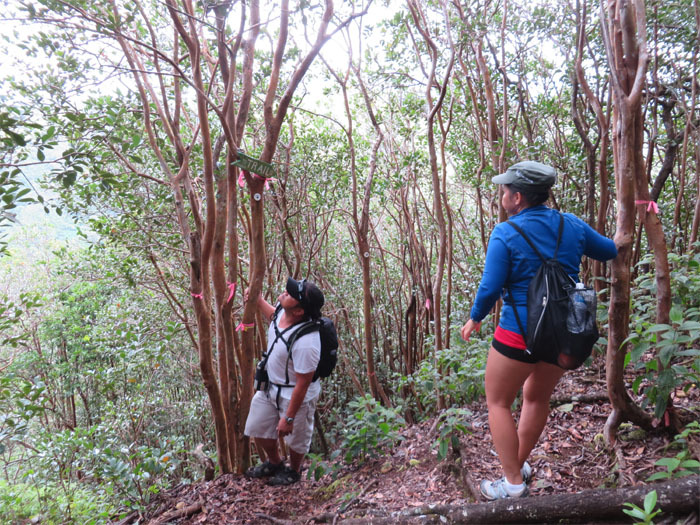 I would not characterize this as a technical hike, but I have seen and heard other hikers get hurt and/or lost on even the easiest hikes. You never know. If you get hurt and you can’t call out, then you would be in serious kim chee. At least let somebody know where you will be going and your expected time back if you insist on hiking solo. Hope this helps, stay safe and have fun! I work for Papahana Kuaola Lelekamanu Program. 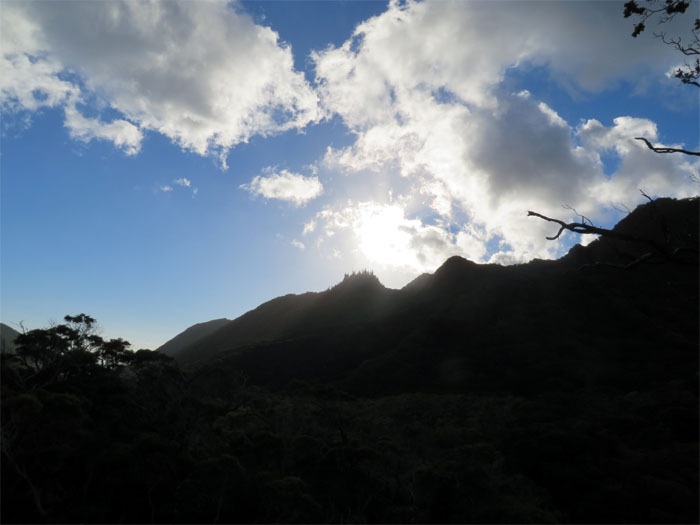 We are currently developing a bus excursion for Kupuna groups of the Ko’olau and sharing mo’olelo through Hawaiian mele(song, chant) of sacred and special places. 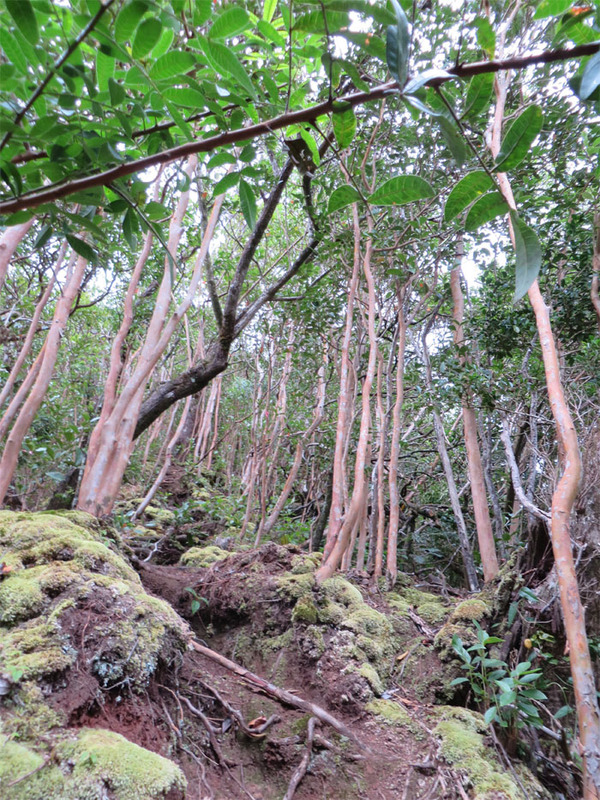 Pu’u o Keahi a Kahoe is a place described in various Windward, O’ahu mele. 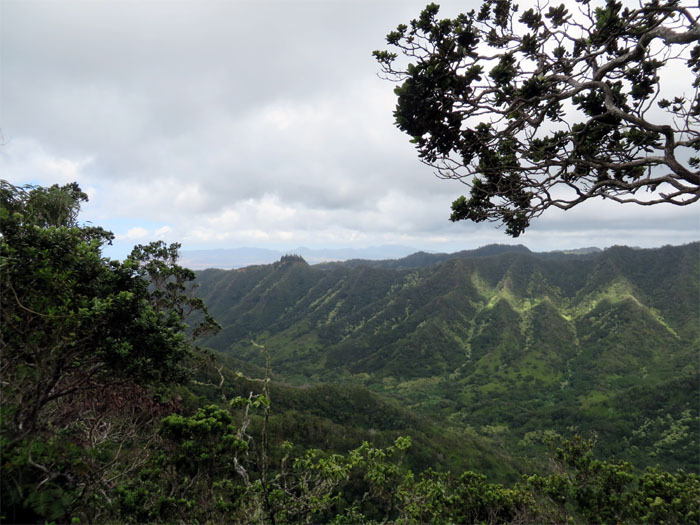 Hiking is not an option for Kupuna on this place-based cultural experience, so providing pictures on tour of these cultural sites helps Kupuna to imagine the feeling and energy of the place and space. 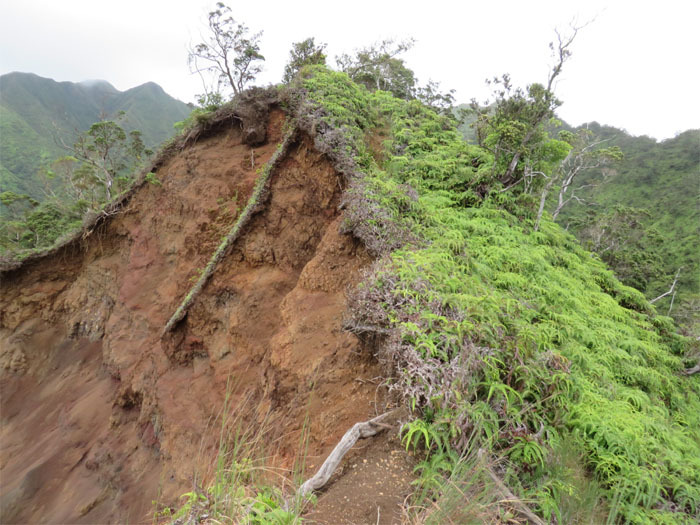 I would like to ask your permission to use your photograph of Pu’u Keahi a Kahoe on the tour as interpretive tools/visuals for tour to benefit Kupuna participants. Please respond at your earliest convenience. 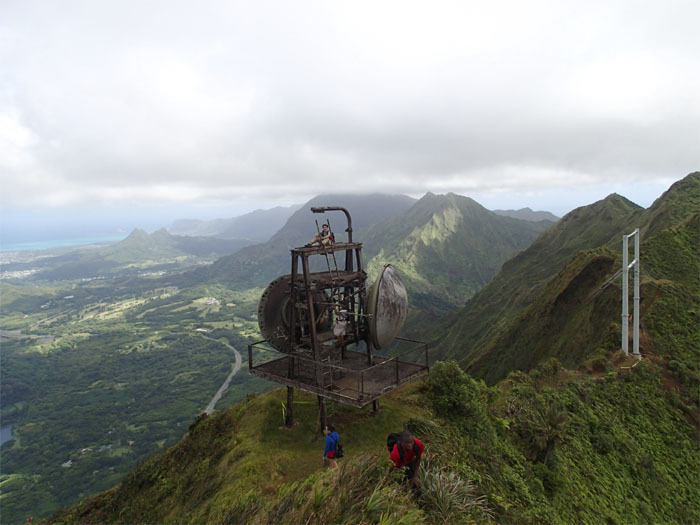 Our Ko’olau Kupuna Mele Tours will begin next year in January and end in September. Hope to hear back from you soon. 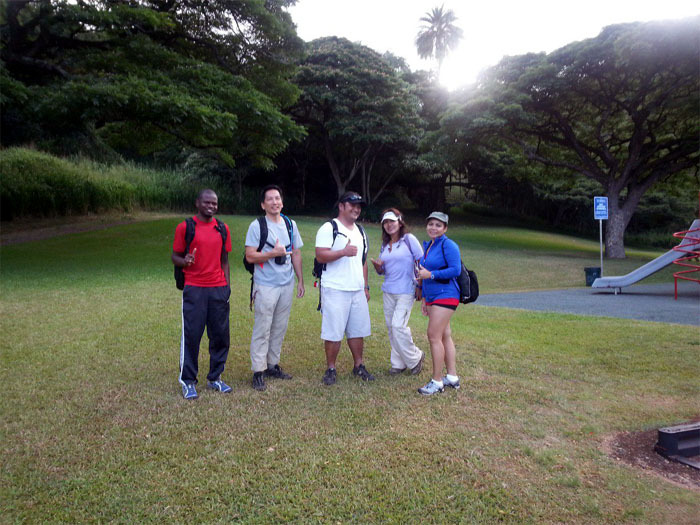 Thanks for your interest and your program that helps out our kupuna. Feel free to use any photos that you think that will help enrich the experience.